Who do you call when you need insight on a relationship, your career, or just a hard-to-navigate situation? Your mom, your best gal pal, your fiance? Regardless of who you run to, there is nothing like receiving insight and guidance from someone who has gone through a similar experience, right? The same goes for wedding planning! We polled some recently married Pittsburgh ladies and asked them to help all of YOU! Boy did they answer! They sounded off on the various ways they saved money, areas on which they splurged (and don’t regret one bit), and things they wish they would have done a little bit differently. We rounded up the best of the best tips to make your wedding planning experience just a little less stressful. Trust us…you’ll definitely want to heed this wedding planning advice from former Pittsburgh brides! We chose a ceremony location that didn’t need any additional decor. The space was beautiful the way it came! We were VERY selective with our guest list, cutting out extended relatives and friends we hadn’t talked to in a year or more. Our bridal party was only four on each side as well. We chose a venue that was inclusive of linens, chairs, etc. so we didn’t have to spend extra on rentals. Since our ceremony and reception were both in one location, we saved a ton of money. For favors, we made homemade limoncello and bottled it ourselves. Lots of Pinterest and internet searching for good deals and ideas! I picked shoes that I could absolutely wear again. I also used a lot of Etsy templates for printed signs around the reception. We had them printed at a local print shop, which saved us hundreds but still made the venue look top notch. One of my bridesmaids and I created most of the decorations and favors with the help of her Cricut machine! Rather than renting chargers, we purchased them for less than the rental fee and resold them after the wedding. We got creative with catering and served one dual entree instead of offering entree choices. Our family and friends made all of the cookies for our massive cookie table. I helped my bridesmaids save by picking dresses Calvin Klein black cocktail dresses from Macy’s. They were super cute, under $100, convenient, and ACTUALLY re-wearable! Flowers! I love flowers so I didn’t care how much the bouquets were. We splurged on our caterer, which was so important to us. We are your typical Pittsburgh “foodies” and we wanted everyone to have an amazing meal. Our photographer was expensive and SO worth it. The band! It just brings a different element to the wedding – a higher level of entertainment for all guests, even those who are unable to dance or don’t like to. It was important for us to have good food, so this was our biggest expense. Our DJ! Totally worth the money we spent! Photography. The pictures are our keepsake from the wedding so, we wanted to make sure we had photos that we loved and were our style. Worth every penny. I splurged on my dress and shoes, which I definitely don’t regret. I splurged on extra labor to have someone set up and take down the flowers at the end of the night so that my family could enjoy themselves. The fees are worth the happiness of my mother-in-law and mother. Hair and makeup, as well as a nice hotel suite to use the night before and night of the wedding. Photography. We are so in love with our photos that I find myself looking through them daily. Linens that really helped make the space pop! I paid for my girls to have their hair done. Why should they have to pay so much money to be part of MY special day? We spent more on the venue than we originally planned because it had everything we really wanted all in one place. I wish I would have splurged more on linens. I know some people don’t notice but I did. A smaller bridal party. I spent too much money on gifts and hair and makeup for them. I felt overwhelmed getting ready. I would have had a day of coordinator. We probably didn’t need to have top shelf liquor, but rather just an open bar with the basics. I honestly wish I spent even more on flowers to make the atmosphere just perfect. Wearing heels was a horrible idea. I knew I’d switch to flats for the reception, but I got my dress altered for my heels. Dumb. I regret having a larger bridal party. It was expensive to buy gifts for them and several of them were out of obligation, not because of a personal connection with me. I wish we would’ve splurged more on the cupcakes. We had someone we know make them and while they were ok, I wish we would’ve spent more money and went with the well-known bakery nearby. The only thing I would have done differently is rent tuxes through a local store rather than Men’s Wearhouse. We had issues with sizing on the tuxes, a lot of guys had to make multiple trips to the store, and my husband was missing his pocket square. If I could do it all again, I would maybe go with somewhere that we could bring our own food and drinks, or maybe somewhere that was all-inclusive and had decorations there for us. Tearing everything down at the end of the night and getting everything together wasn’t the romantic end of the night I had planned! I wish I didn’t do selected meals for my guests. I wish we went with a duo plate. It would have been easier and cheaper and still looked just as nice. I regret having such a large affair. 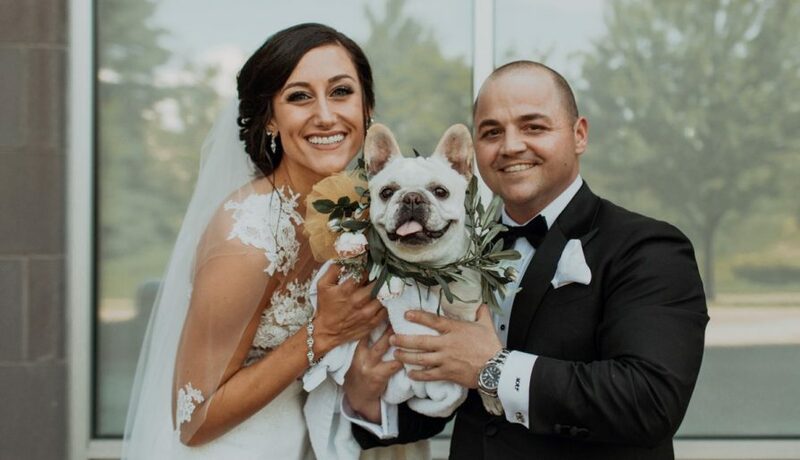 I wanted my wedding to feel like a huge event that everyone wanted to come to – and they did! But I didn’t ever talk to so many of themr again or they did not invite us to their wedding just eight or nine months later. I think I spent close to an extra $3,000+ on people that didn’t really matter to me. I advise all brides to reallllly look at that guest list. I regret not getting a videographer, or at least having someone film our ceremony and the speeches, just like everyone said I would. I wish I would have been more present during the day. It was very much a whirlwind day, and I don’t think my husband and I relaxed until almost 9 p.m.
Notice how many brides do not regret spending a lot on photography…or how many wished they would have hired a videographer!! While you gotta do what works for you, we hope it’s helpful to get inside the head of a bride who has already been there! 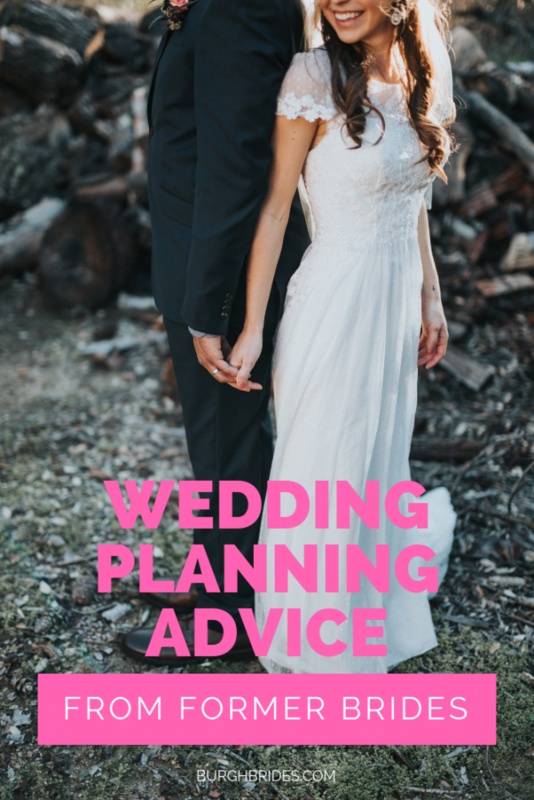 If you’re a former bride and have some advice not mentioned, comment below!